Imagine walking down a busy street with cars rushing by and trash all around. Suddenly, you turn the corner, and see a space that is lush and green. The space is quiet, with small planting beds filled with flowers, vegetables, and herbs. “Where am I?” you ask. Luckily, you have just found a GreenThumb garden. Green Thumb gardens are community-based, volunteer-run spaces that are open to the public. GreenThumb volunteer gardeners love to share their garden spaces with the rest of New York City and the world. They host events, workshops, and participate in garden tours. 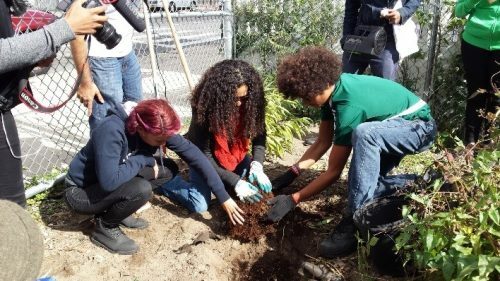 The 20,000 community gardeners that make up the 600 community gardens in New York City are known to host farm tours, district garden tours, and even celebratory parades that emphasize the work they do around New York City. Many of the tours take place in the spring, summer, or fall when the gardens are in full force. One walk of particular significance is the Morgan Powell Walk in October. This walk is held in memory of Morgan Powell, who often led his own “Jane Walks” throughout Brooklyn and the Bronx. Morgan was a GreenThumb gardener, writer, and Black New York historian from East New York. 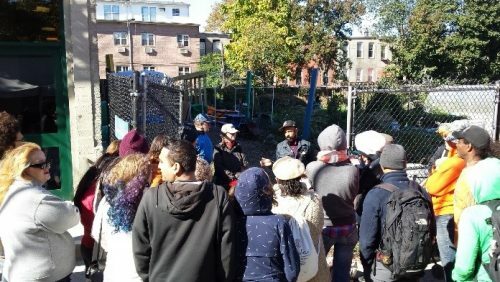 In line with Jane Jacobs’ ideas around supporting local economic development, the tour was established in partnership with Cypress Hills Local Development Corps, as well as East New York Farms and GreenThumb. This walk also functions as a celebration of local businesses, historic sights, and transformed open spaces, as well as a chance to remember Morgan. Lead by Eric-Michael Rodriquez, the walk emphasizes how once vacant lots were transformed into vibrant community gardens. The tour visits five gardens where resident gardeners show off the best features of each space – bees, and vegetables, chickens, and fruit trees. Modeling Jane Jacobs’ philosophy of cities as living beings and ecosystems, the tour emphasizes how gardens are not only used as spaces for growing food, but also are places to celebrate, build community, and reflect on the cycles of life. If you would like to stay up to date about our garden walks and other GreenThumb events, join us on Facebook, Twitter, Instagram, and Tumblr or visit our website: www.greenthumbnyc.org.